However strong the strategy, you should occasionally look at the results. Here’s the Take Away: To know more, connect with me on Strava or just IM me with queries. This year, I have been working on running faster at lower heart rate (BPM). 80% of my Runs are at Lower Heart Rate (Easy Pace) and 20% are Hard Runs. That’s my training strategy for Tata Mumbai Marathon, 2019. Looking back.. this is the point where my breathing was absolutely fine but my legs were unable to take me any faster due to fatigue. (Although, I did not suffer with cramps, but I know a lot of people who did). I have been working on two methods to overcome this. One by lowering my heart rate (as mentioned in point 1). This will help prevent fatigue and build endurance overtime, thereby allowing the leg muscles to help me go faster for a longer duration. Two is the Negative Split strategy that I have already shared with you guys last month. Start slow – Finish strong & fast. We all know this one is hard to beat, and it’s not just because of the elevation. In a normal training session this slope is definitely long but easily manageable. However, in a Full Marathon Race, this segment comes at KMs 35 & 36 and it becomes a challenge to maintain the pace in the final leg. I ended up losing 30-40 secs here and yes also the momentum. Lots of Hill training sessions and the usual negative split strategy (i.e. preserving energy for the final leg of the race) should help overcome this one too. Hydration plays the most important role in sustaining the pace throughout the race. My strategy is to gulp on 180ml fluid (preferably water) every 30-45 minutes and occasional round of electrolytes, gels etc.. 2-3 times during the race. ​Finishing a Full Marathon always seemed impossible, but only until it was done. Now, having completed it successfully, it feels very much like being on top of the world. It definitely is one of the best feelings ever and with that finally I’m able to check one long awaited goal in my bucket list. 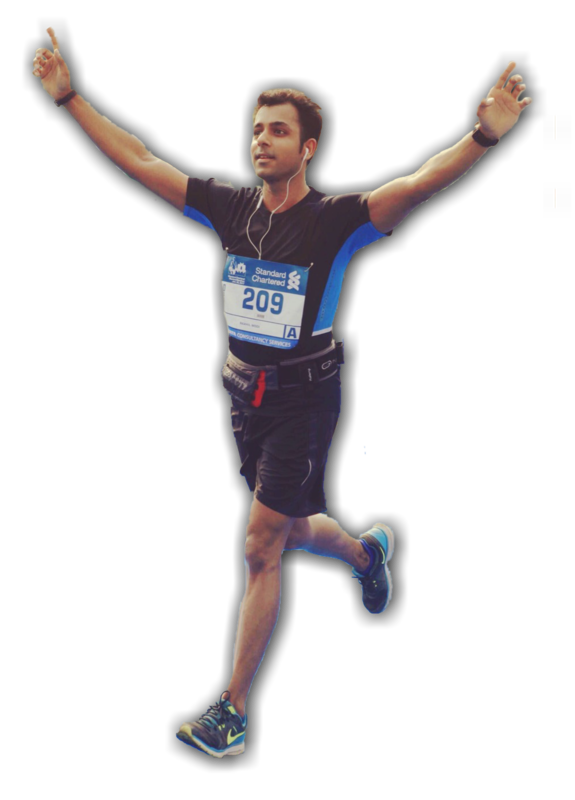 Raahil Modi is a Mumbai-based marathoner focused on living a Joyful, Healthy and Vibrant life. #RunwithRaah follows his journey as a runner, the beginning, the struggle, self-discovery and all things fitness. It all began with that first plank. Now it’s a part of me.